Diabetes doesn’t just have a huge impact on the world’s healthcare systems; the impact on the sufferer is life-changing, and in some cases, once in an advanced stage, life-threatening. This is why charities are working so hard to help increase our awareness of the initial symptoms, as early diagnosis can be critical in managing, and often reversing, the condition. Type 1 diabetes is an autoimmune disease that only affects around 10% of the population and the causes are yet to be proven. However, understanding the causes of type 2 diabetes, which affects the vast majority of sufferers, is essential to reducing the risk of becoming a diabetic. These very specific symptoms occur for a reason: because the glucose can’t enter cells and is forced to stay in the blood, it can’t be used as fuel for energy, hence the tiredness; the body then tries to flush out the excess glucose in the urine, causing frequent urination and consequently excessive thirst; the unusually high levels of glucose in the urine are a perfect breeding ground for fungal infections such as thrush; high blood sugar levels also make cuts harder to heal and leave wounds open to infection; and vision is affected by a combination of small blood vessels becoming damaged from too much glucose, and fluid moving in and out of the eye causing the lens of the eye to swell. There are a range of complex presentations of diabetes, but they can generally be split into type 1 and type 2. This is a serious, life long condition which affects around 10% of sufferers. It’s still not known exactly why it occurs and seems to have nothing to do with lifestyle or diet. Type 1 diabetes occurs when the pancreas stops working properly, and is unable to make enough insulin, or in some cases any at all. The symptoms, which are the same as above, can come on very quickly with very little warning. It is most commonly diagnosed in children, though can come on later in life. This is the more common form, affecting around 90% of sufferers. This occurs when diet and lifestyle cause the body to become overwhelmed with glucose and the pancreas becomes less efficient through strain from both the extra glucose from unhealthy foods, and a build up of unhealthy fat around the organs. The symptoms are the same as for type 1, but whereas type 1 gives you no warning signs, type 2 can come on very slowly, and if diagnosed in time during the pre-diabetes or borderline diabetes stage, with careful management it can be reversed. This is a critical stage of the condition’s development as, in most cases, lifestyle choices can be made to potentially reverse the condition. Taking early decisive action at this stage can halt the development of type 2 diabetes, but to do so, it is vital you are aware of the warning signs and visit your family doctor as soon as you detect any relevant symptoms. Testing for diabetes involves a simple blood and urine test to check your blood sugar levels. If you’re diagnosed with pre-diabetes, you’ll be given clear guidelines on how to prevent the condition progressing into full blown type 2. In most cases, the two key factors you need to act on are changes to diet and increased physical exercise. If you follow these guidelines you are less likely to develop type 2 diabetes. Who is at risk of diabetes? You are of Afro-Caribbean descent and South Asian descent, as ethnicity also plays a role. The World Health Organisation estimates that over 382 million people worldwide are living with diabetes. This figure is expected to rise to 642 million in just over 20 years. Currently 29 million Americans are diabetic, while in the UK the figure is around 4 million, or 1 in every 16. 10% of the NHS annual budget is being spent on treating the condition. 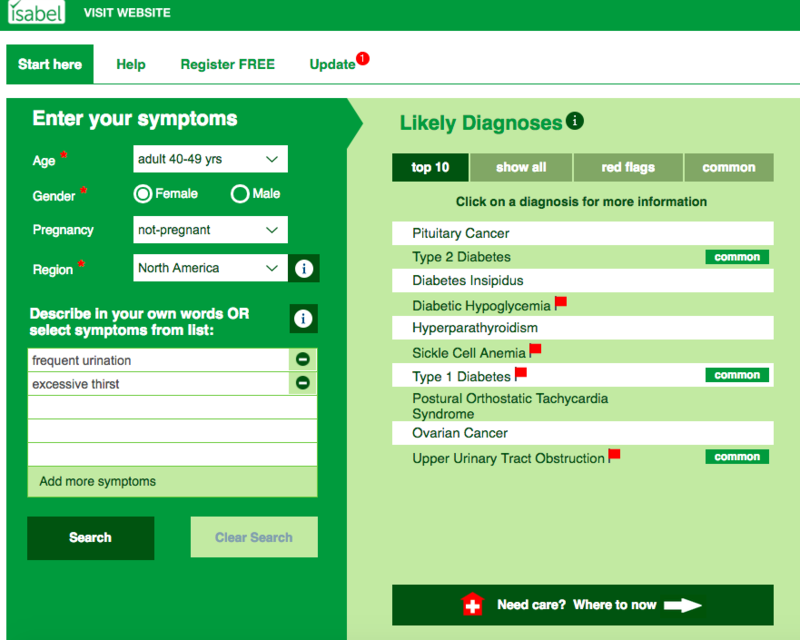 If you’re worried that you might be at risk of developing diabetes, do this simple test to find out, or enter any symptoms you might have into the Isabel Symptom Checker and discuss the results with your doctor.